A line of zebrafish specially generated at the University of Oregon had a key role in discovering the cause of Saul-Wilson syndrome, a rare disease seen in just 15 cases worldwide. The discovery was detailed Oct. 4 by an international team of scientists in a paper published online ahead of print in the American Journal of Human Genetics. Researchers found that the disease — marked by dwarfism, microcephaly, hearing loss and developmental delays — results from an alteration in a gene that codes for a protein that is part of a stacked pancake-like structure known as the Golgi complex that directs protein traffic. Westerfield and his research associates Aurélie Clément, Bernardo Blanco-Sanchéz, Jennifer Phillips and Jeremy Wegner, led the UO’s contribution to the study and were among a long list of co-authors from both inside and outside the United States. 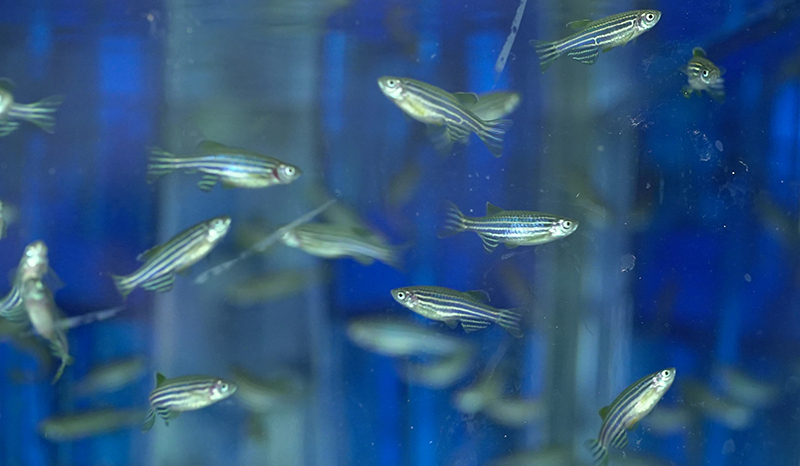 The UO-produced zebrafish mimicked the short stature, developmental delays and other affects characteristic of the disease. The finding also advances the understanding of how Golgi complexes affect human health and may apply to additional skeletal disorders. For families affected by Saul-Wilson syndrome, Westerfield said, knowing the cause will allow for genetic testing to help rule out the likelihood of passing the disease on to other children. The research focused on a genetic analysis of 14 people with Saul-Wilson syndrome, which was first defined in 1990. All had the very same change in just one copy of the gene that codes for a specific protein, COG4, in the Golgi complex. Additional details are available in a news release issued by Sanford Burnham Prebys in LaJolla, California.